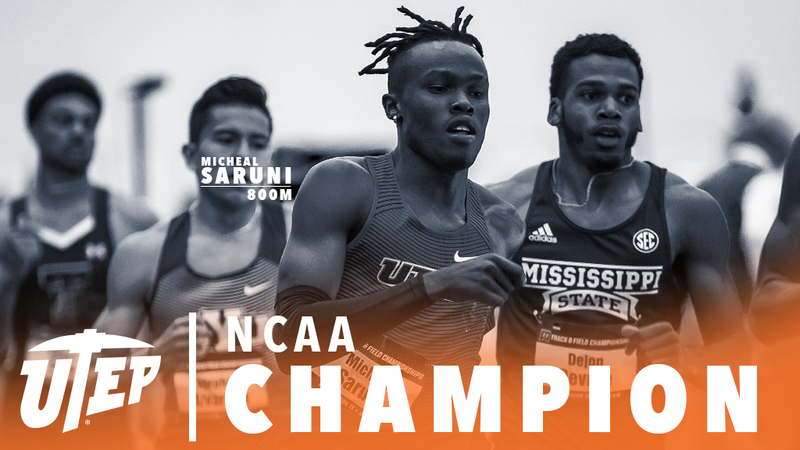 UTEP's Michael Saruni wins his first NCAA Championship in the 800m clocking a time of 1:45.15 on March 10, 2018 in College Station, Texas. "He finally got that national title he has been chasing ever since he came to UTEP," said head coach Mika Laaksonen. "When he runs his race like today, no one can touch him. Setting the records at this level of competition speaks volumes and we couldn't be happier for him." Saruni's time sets a new facility and meet record at the 2018 NCAA Indoor Championships. The facility record was held by Donavan Brazier (Texas A&M, 2016) at 1:45.93 and the meet record was previously held by Patrick Nduwimana (Arizona, 2001) with a time of 1:45.83. The sophomore is the second Miner to win the national title in the 800 following his previous teammate Emmanuel Korir (2017). The sophomore's career has been nothing short of spectacular, setting a world record in the 600m (1:14.79) and set the No. 2 NCAA All-Time Best in the 800m (1:44.89) both in the month of January. Jonah Koech competed in the mile final garnering a ninth-place finish with a time of 4:02.26. "Jonah ran a smart race and was in great shape with a quarter mile left. He just couldn't finish it the way he would've like to. He has tremendous talent and will work hard." The junior earns NCAA Second Team All-American honors marking his second career honor. This was the third consecutive appearance at the national stage for the Kenya native in the mile event. The UTEP track and field team will return to action when they open the outdoor campaign on Saturday, March 24 with their home meet at Kidd Field.